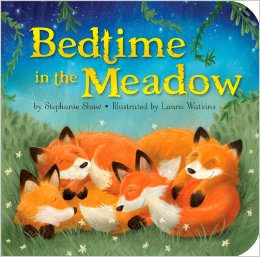 We'll start with Bedtime in the Meadow which is a padded board book by Stephanie Shaw. Very sweetly the animal mommies and daddies are putting their babies to bed. "Hush, baby, hush. Now close your sweet eyes. Stars are all blinking in sleepy, dark skies." The butterflies and meadowlarks are getting cozy for the night. The fox den is cozy with all of the kits cuddling up with one another. Each page spread offers 1-2 sentences making this a short, relaxing sort of read. 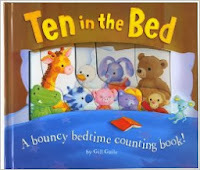 No guarentees on this (or any of these others) helping your children to go to sleep but it certainly is a calm book and a nice one to read with a little person cuddled up on your lap (or in their bed). The illustrations by Laura Watkins contribute to the friendly feeling this particular book offers. Secondly, another padded board book with an awesome message which is - in all likelihood- quite true: I Love You More . This title, which is written and illustrated by Sebastien Braun enables the adult read to communicate with their young listener that they are loved more than sunshine, more than rain, or even playtime. The baby bear in this book understands that the parent will always be there, beside them, no matter what. 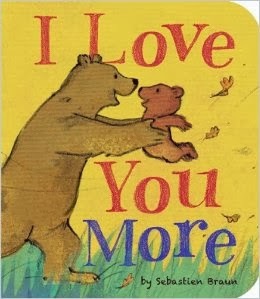 Through thick and thin and everything in between, there is a whole lot of love between the two bears in this book. It concludes thusly, "I love you more than all the world, and more and more each day." As this is very true for me towards each of my kids, I rather like this one. Bears seem to feature heavily in these new titles. Such cuddly creatures I suppose! I expect it has something to do with our human affinity for teddy bears. 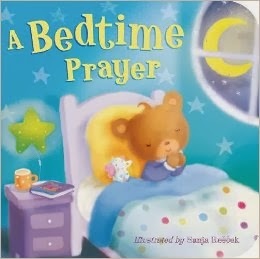 At any rate, another bear graces the cover of A Bedtime Prayer . However, open the covers and you'll find a wide variety of animals preparing for bed and saying their nightly prayers. And give shelter in the storm. We'll be safe and sound and warm." In my opinion, this is a beautiful book and my favorite in the entire new line-up! As you turn each thick cardboard page in this book, you are also rolling one animal out of the bed, one by one. As the song goes, you start out with ten animals in the bed and end up with one. In this case, that one is a lonely one. The other animals climb back into the bed and snuggle up tight. Good night! Good night! This book is laid out with a different format which makes it a bit more unique than others and the illustrations by Guile are quite lovely. "Cuddle close - our day is done. Sweet dreams, my precious little one." And even if your kids aren't yawning by the end of these, well, maybe you will be. These types of books can work their magic on adults sometimes better than children. At any rate, reading a book is a good way to bring your day with littles to a close. Many thanks to Tiger Tales Books who sent copies of the above titles in order to facilitate this review. I received no additional compensation for this post and all opinions are my own. I have an 8 month old grandson so love hearing about these books. Thank you!